The cooling process of cooling pads system is fulfilled in its core pile cushion. When the outside hot and dry air is pumped through the pile cushion, the water in the thin water membrane formed on the ripple piles will be turned in to vapors by absorbing the heat in the air so that the incoming air becomes cool and moist. It happens naturally as if the wind blows over the water surface. 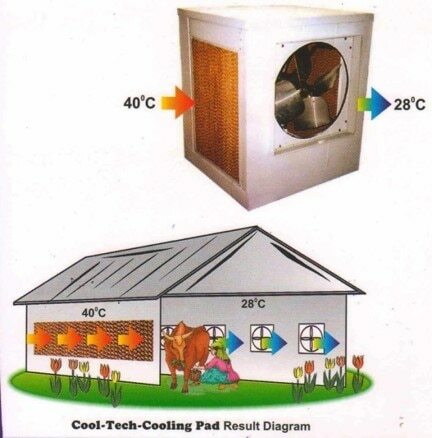 Therefore the vertical ventilation and cooling combination of cooling pad is the most economical and effective cooling measures. According to the applications in several years, a properly designed & installed cooling system is capable of controlling the room –temp at around 28°C even under the scorching weather. Evaporating cooling is a physical phenomenon in which evaporation of a liquid, typically into surrounding air, cools an object or a liquid in contact with it. Latent heat describes the amount of heat that is needed to evaporative the liquid; this heat comes from the liquid itself and the surrounding gas and surfaces. When considering water evaporating into air, the wet-bulb temperature, as compared to the air’s dry-bulb temperature, is a measure of the potential for evaporating cooling. The greater the difference between the two temperature, the better the evaporative cooling effects. When the temperature are the same, no net evaporation of water in air occurs, thus there is no cooling effect. An air handler, or air handling unit (often abbreviated to AHU), is a device used to regulate and circulate air as part of a heating, ventilating, and air-conditioning (HVAC) system. An air handler is usually a large metal box containing a blower, heating or cooling elements, filter racks or chambers, sound attenuators, and dampers. Air handlers usually connect to a duct work ventilation system that distributes the conditioned air through the building and returns it to the AHU. Sometimes AHUs discharge (supply) and admit (return) air directly to and from the space served without ductwork. A chimney is a structure which provides ventilation for hot flue gases or smoke from a boiler, stove, furnace or fireplace to the outside atmosphere. Chimneys are typically vertical, or as near as possible to vertical, to ensure that the gases flow smoothly, drawing air into the combustion in what is known as the stack or chimney, effect. The space inside a chimney is called a flue. We Breezeair is committed for the appropriate design and supply of industrial blower and Axial fan as per customer requirements. We design and manufacturer a wide range of centrifugal fans for most industrial applications. Whether you require it for high efficiency, low noise, clean air, handling light dust or large solid particles, you will find a fan to suit your requirements. Our centrifugal fan impeller designs include backward bladed, backward laminar, backward curved, backward aerofoil, flat backward, forward curved, radial paddle blade, and radial blade high-pressure blowers.